Discussion in 'Electronics' started by berntd, Mar 24, 2017. This is crazy but maybe someone can help? When I lock, indicators flash 3 times normal but no locking occurs. When I unlock, The boot pops open!! When I press boot open, boot also pops open. When I open driver door, boot pops open. When I press door unlock on dash, boot pops open! No autolock when driving occurs. I have had this before and it went away after a week or so. It seems to begin after heaps of rain. What, where can I test / check? Pump in boot is dry. I would suspect a wiring issue at the boot hinges. How old is the car alarm, is it the factory original or was it replaced at some time in the past? Are the electrical connections to the pump clean, try disconnecting all the electric plugs to the pump for 20 minutes. Ensure that you can open the boot with the mechanical key blade in case the situation becomes worse. There is no alarm installed. The boot light goes on/off when I press the switch for it. The boot opens when I press the latch button. Can I read anything useful here with carsoft perhaps? Someone else must have come across this surely? Last time this happened I stripped the pump and resoldered the pcb, cleaned the vontacts and used contact cleaner on the connector. When you say there is no alarm installed, do you mean the car left the factory with no alarm fitted or the alarm siren was removed at some point in the past? The alarm siren contains the brains of the alarm system. I ask because its very unusual for there to be no alarm system fitted to a 1998 W202… this is a UK car isn’t it? Other areas worth checking is the below the windscreen drain on the passenger side, it could be blocked, allowing water into the passenger foot well. There are some electronics in the passenger foot well, see picture below, see if there is any sign of wet in that area. Alarm never installed. Is Australia / South Africa model. Right hand drive but no alarm. I agree with the fact that it has to do with water somewhere but can't find it. That electronic box you show in the puctures is the automatic transmission controller for the 722.6 transmission. I doubt very much that that picture was from a 1994 model as mentioned. I think 1997 was the earliest for 722.6. Mine is a 1998 after facelift model. 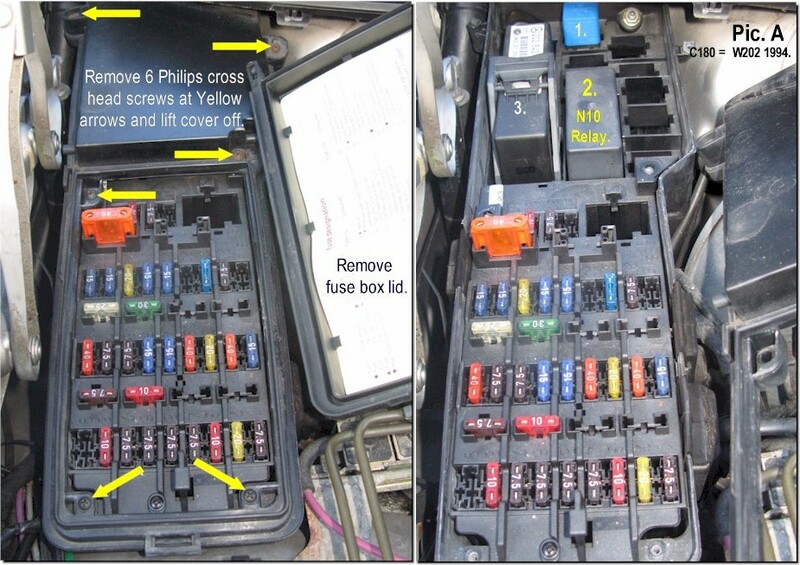 The most likely place to get water damage is the passenger foot well or the front SAM at the driver side fuse box. You say the only time the vacuum pump runs is when you unlock/open the boot, how long does the vacuum pump run for when the boot is opened/unlocked… it should run for about 2 or 3 seconds? Perhaps in 1994 they fitted the imobiliser in the footwell. Could be because there was no electronic transmission. On mine, the same place is the trans control. I know because I replaced it before. Anyway, when locking, no pump action. When unlocking, about 0.5- 1s pump actionand boot pops. Boot opening actuator is pneumatic. Is SAM near that fusebox? I thought it is behind the radio somewhere? 2 seconds is normal for the pump to run, just wanted to know if it was running excessively like maby 10 seconds or so. Below is the underside of it. Remove 6 screws to get at it. I just checked cod3s with carsoft and SAM as well as PSE have no errors. The carpets and behind are dry. Overnight, it fixed itself and is working normally at the moment. The SAM and fusebox bottom are all dry and clean. Looks like new in there. It must be something else getting wet but what and where? Must be a miracle, were you praying last night. You will just have to wait and see what happens, maybe disturbing the front SAM did something, perhaps a bad solder joint somewhere, that’s just as likely as a wet issue. It is not fixed. It acted up again this afternoon. When my partner opened the passenger door, the boot popped open again. What other switches and sensors are there? I could get a used PSE pump/unit but can it be re-programmed to wok on my car? In situations like this, replacing the pump from the same car/part number is what people do, sometimes with success. No need for programming but you must get the same pump with some guarantee that it is in working order. If replacing the pump fails then a used front SAM is the next thing to try, this is known as throwing money & parts at the problem but what else can you do other than pay more money for Mercedes STAR diagnostics. There is a printed circuit board in the SAM … Mercedes-Benz SAM (Signal Acquisition Module) Explained … maybe you could strip that down to investigate further. 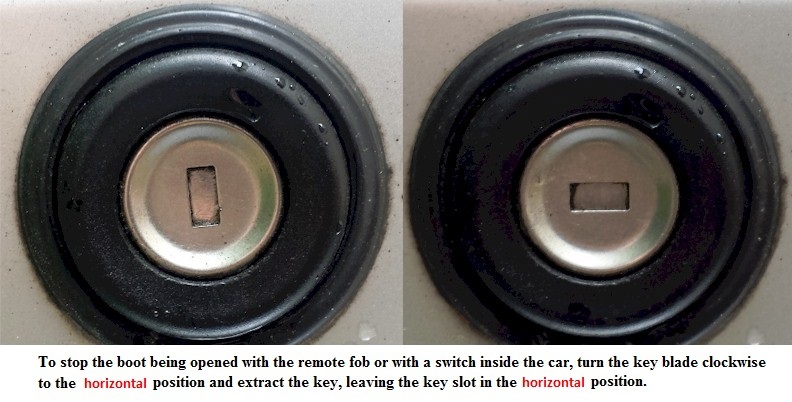 There is an RF receiver for the remote fob in the back window but you said the central locking switch on the dash was not working so that might rule that out. Not sure what else is involved in the way of sensors. The fact the fault has returned kind of rules out a wet issue causing the fault. If the mechanical key blade works properly in the boot lock then the above will stop the boot lid opening when it shouldn’t, this won’t stop the vacuum pump running when it should not. So it fixed itself after a warm sunny day and has been fine since.